Mario has a passion for sewing machines. Not only does he repair and sell them, he also collects vintage machines. People from all over seek his services and he travels to China once a year to stay updated on the latest trends. 35mm. Empty dance floor. La Cita, Downtown Los Angeles. 35mm. El Patio. Downtown LA. 35mm. La Cita. Downtown LA. 35mm. Indoor bar. La Cita. LA's greatest dive bar, a microcosm of Los Angeles with stiff drinks and great music. 35mm. Virgil Village, Los Angeles. My quickly gentrifying neighborhood. 35mm. 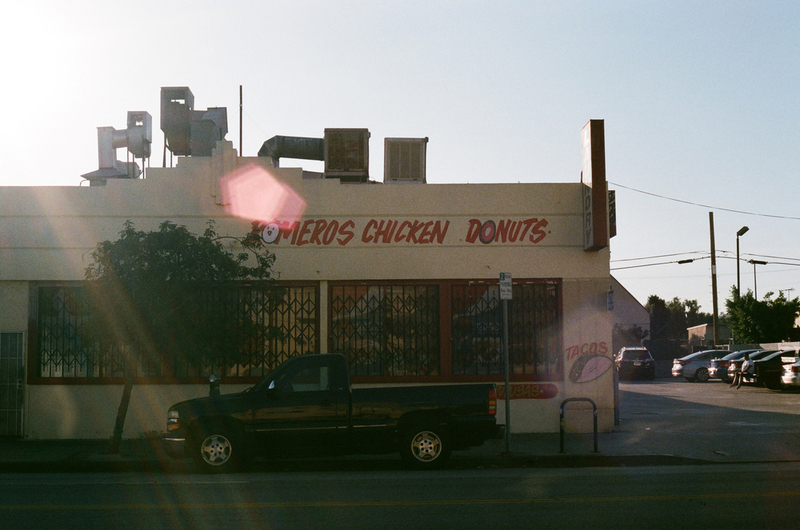 Romero's chicken and donuts, great burritos. Virgil Village, Los Angeles. 35mm. You are god. Silver Lake, CA. 35mm. Convenience store. Silver Lake, CA. 35mm. No longer here. Silver Lake, CA. 35mm.